The presenter mixer system allows on-air presenters to adjust the audio levels fed to their radio or wired IEM systems, whilst also allowing Sound Control Room operators to adjust the levels remotely. 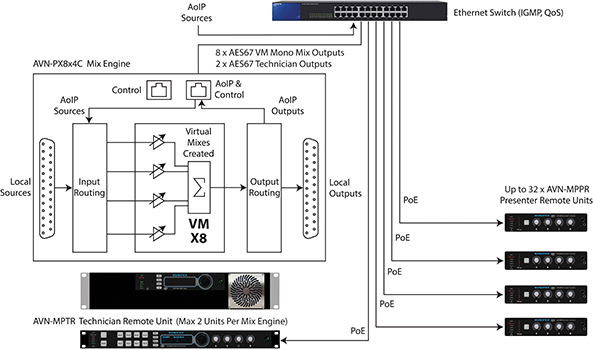 The system consists of 3 types of unit all connected on a common Ravenna Audio over IP (AoIP) network with added audio sources derived from Ravenna based AoIP mixers or input portals. Setup and control can be provided via webpages and/or 3rd party applications. The system uses mono audio throughout. AVN-PX8x4C - a 2U rack mounted Mix Engine Rack. AVN-MPPR - a small desk, or microphone stand, mounted Presenters’ Remote Unit. AVN-MPTR - a 1U rack mounted Technicians’ Remote Unit. 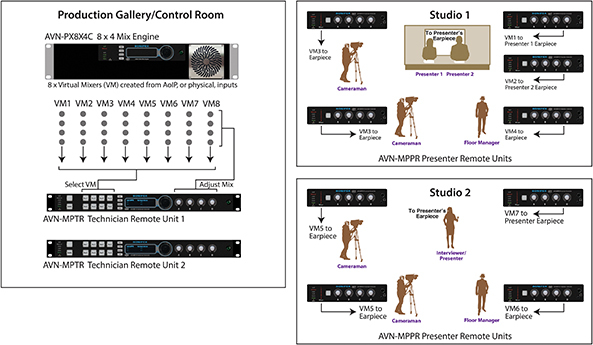 The AVN-MPPR presenter remote provides the mixed audio to the presenter’s earpiece via front panel ¼” & 3.5mm headphone outputs, together with a rear panel XLR output. The four rotary encoders control the 4 channels of a selected virtual mixer, and give both visual feedback for mix level of the source and actual input level. Multiple units can simultaneously control any of the 8 virtual mixers in the main mix engine with the VM number displayed on the front panel. 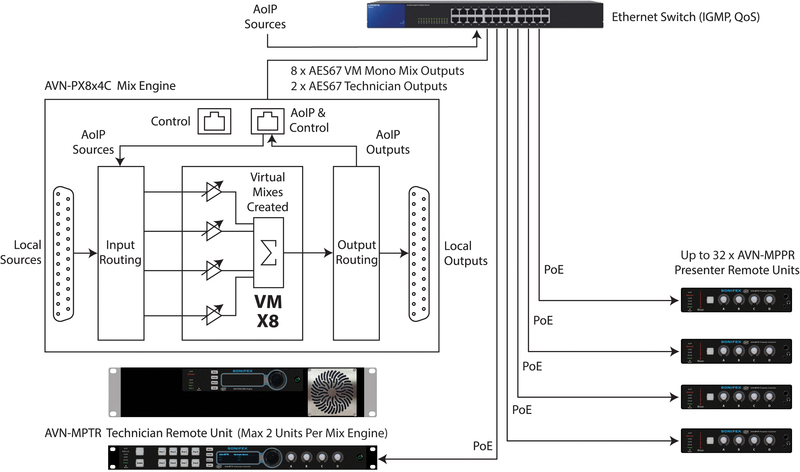 Audio is transported from the mix engine to the remote using AES67 AoIP with a single PoE Neutrik ™ Ethercon network connection. Units can be mounted on a standard microphone screw thread or under a desktop using optional accessories. By default, the audio on the XLR output on the rear of the unit is not muted when headphones are connected to one of the sockets on the front of the unit. However, there is a “Headphone XLR Mute” configuration setting in the “Misc Settings” section of the webpages to enable the muting of the XLR output on headphone connection if required. The headphones will have an additional software-configurable output level control (one for each headphone output) to set the attenuation of the signal to the headphone driver for comfortable levels at normal signal level from the output. GPO Button - The button between the STATUS LEDs and the rotary controls provides a virtual GPO from the unit that can be used on the Mix Engine to trigger a GPO on its remote port. This button will illuminate red when it has been selected by this MPPR and will be yellow when initiated by a paralleled MPPR or MPTR. IP Address Reset - As well as being able to set the IP address of the unit via the web pages, it is also possible to reset the IP address of the unit from the front panel to a factory default. Network Connector - This is a Neutrik etherCON RJ45 CAT5e connector with latching lock with PoE plus for unit power. Mix Output Mono Analogue Output - The mix output is a XLR 3 pin XLR male output which is electronically balanced. Standard GPIO Connector - This is a 15-way female ‘D’-type connector with the same pin connects as for the AVN-PX8x4C Mix Engine. Product Function: The AVN-MPPR presenter remote provides the mixed audio to the presenter’s earpiece via front panel ¼” & 3.5mm headphone outputs, together with a rear panel XLR output. Typical Applications: Production galleries, control rooms and studios. 4 rotary encoders control the 4 channels of a selected virtual mixer. 1, XLR, plus ¼” & 3.5mm headphone outputs. Software-configurable output level control (one for each headphone output) to set the attenuation of the signal. Can be mounted on a standard microphone screw thread or under a desktop using optional accessories. 0dBFS Line-up: +15/+18/+20/+22/+24dBu Balanced* +20dBu Maximum when no attenuation factor applied.